It is easy to just run a stock screen looking for good dividend stocks and find a few worth evaluating for addition to your portfolio. Many investors have had success by buying dividend stocks and compounding their returns over time. This will generally bring you back to the classic blue chip stocks. These stocks are consistent and steady performers. However, did you ever wonder what these stocks produced when they were younger such as 25 years ago? Yeah, these types of stocks made many millionaires. So if you want to follow a similar path, where would you start today? I have an idea to identify stocks that have performed well in the past 5 years. I am looking at 5-year growth rates in revenue, EPS, cash flow and book value. The real superstar stocks will dominate these metrics and have cash to share with owners. To make my list, each stock must have at least a 10% 5-year growth rate in each metric and payout a rising dividend during this period. It is these stocks that I call “The New Dividend Superstars.” These are stocks that you may not think of as dividend stocks. But in a few years your yield on cost will be much higher than you realize. Lastly, you will avoid the dividend bubble in current high yield stocks. It will take several posts to discuss stocks on this list. So let’s get started. CF Industries Holdings, Inc. (CF) through its subsidiary, CF Industries, Inc., manufactures and distributes nitrogen and phosphate fertilizer products, serving agricultural and industrial customers worldwide. CF has been on a ride with a 31% price increase year to date. CF has a very low yield of 0.84% but it has a 5-year dividend growth rate of 83%. As for the metrics, CF has a 5-year EPS growth rate of 105% with a 5-year cash flow growth of 72%. Revenue growth over 5 years was 25% and book value 37%. Fertilizer stocks are moving higher after the government reported greater than expected damage to corn crops. This should help to sustain the growth of CF in the coming quarters. AZZ Incorporated (AZZ) is a manufacturer of electrical products and a provider of galvanizing services. AZZ is up 43% year to date following great Q1 earnings. The company posted Q1 earnings of $1.26 per share, compared with the prior year period’s $0.75. Excluding non operational income and expense items, earnings per share was $1.02. The Capital IQ consensus estimate was $0.81 EPS. Revenues were $127.1 million, compared with $114.33 in the same quarter last year. Analysts were looking for $122.82 million in revenues. AZZ declared a 2 for 1 stock split of the Company’s Common Stock in the form of a 100% stock dividend, payable on July 30, 2012 to shareholders of record as of July 16, 2012. AZZ is a small stock with a market cap of only $821 million. AZZ has a 5-year EPS growth rate of 12% with a 5-year cash flow growth of 18%. Revenue growth over 5 years was 12.5% and book value 19%. AZZ has a dividend yield of 1.57% that has a 5-year dividend growth rate of 67%. AZZ has a payout ratio of 26%. Herbalife (HLF) is a global nutrition company that sells weight-management, nutrition, and personal care products intended to support a healthy lifestyle. HLF got hammered in May on speculation that David Einhorn of Greenlight Capital would short the stock. This never happened when Greenlight released their new positions. 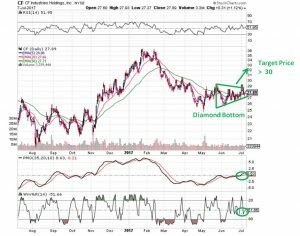 This creates a great opportunity to buy this growth stock $20 cheaper with a higher dividend yield. HLF reported first quarter net sales of $964.2 million, a 21 percent increase driven by a 24 percent increase in volume points compared to the prior year period. For the same period, the company reported net income of $108.2 million, or $0.88 per diluted share, reflecting an increase of 22 percent and 24 percent respectively compared to the adjusted first quarter 2011 net income of $88.7 million and $0.71 per diluted share. HLF recently received seven new retail licenses to expand sales in China. HLF plans to buy back nearly $428 million of its own shares after seeing its stock drop to complete a $1 million buyback plan. HLF is a mid cap stock with a market cap of $5.58 billion. HLF has a 5-year EPS growth rate of 28% with a 5-year cash flow growth of 22.8%. Revenue growth over 5 years was 13% and book value 14%. HLF has a dividend yield of 2.43% that has a 5-year dividend growth rate of 64%. HLF has a payout ratio of 25%. Buying stocks that increase dividends allows you to take advantage of one of the most powerful tools in the investors’ arsenal — the wealth-building effect of compounding. And consistent dividend growth is like jet fuel for the compounding engine. But there are more advantages to companies able to consistently grow dividend payments. One often overlooked “plus” is that they tend to be safer investments. Dividends are a litmus test of a company’s true financial strength. Only companies able to grow earnings through good times and bad will commit to consistently raising dividends. And these are the types of business that tend to see more stability in their shares. UnitedHealth Group (UNH) is a diversified health and well-being company dedicated to helping people live healthier lives and making health care work better. 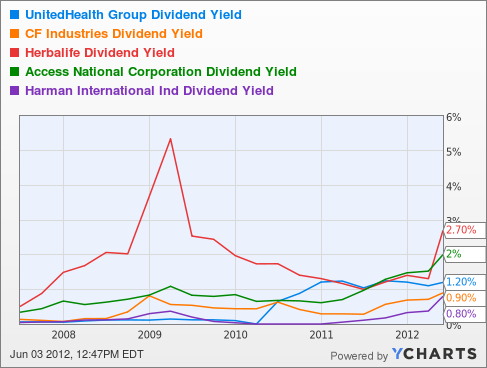 While the clouds overhead are the ruling on Obama’s Health care law, UNH has not missed a beat with its dividend growth. UNH has a dividend yield of 1.18% on a 13% payout ratio. More impressively, UNH has a 5-year average dividend growth rate of 85%. UNH increased its dividend 30% in the past year. UNH has an equity summary rating of 9.4 out of 10 for a VERY Bullish outlook. Fertilizer producer CF Industries Holdings Inc’s (CF) quarterly profit easily beat Wall Street’s expectations due to strong demand for nitrogen during the North American spring planting season as reported on May 5 2012. Long term, we believe tight global grain stocks will sustain high farm profits, plantings and fertilizer demand. CF has a dividend yield of 0.99% on a 5% payout ratio. CF has a 5-year average dividend growth rate of 82%. UNH increased its dividend 300% in the past year. CF has an equity summary rating of 9.3 out of 10 for a VERY Bullish outlook. Herbalife Ltd. (HLF) is a global nutrition company that sells weight-management, nutrition, and personal care products intended to support a healthy lifestyle. HLF sank to a 52-week low as David Einhorn of Greenlight Capital asked a few questions on the company’s earnings call but had no position in Greenlight’s recent portfolio update. HLF has a dividend yield of 2.72% on a 25% payout ratio. HLF has a 5-year average dividend growth rate of 64%. HLF increased its dividend 50% in the past year. HLF has an equity summary rating of 9.7 out of 10 for a VERY Bullish outlook. Access National Corporation (ANCX)) is the parent company of Access National Bank, an independent bank serving the business community of the DC Metropolitan area. ANCX reported first quarter net income of $3.4 million, a 50.3% increase over the $2.3 millionrecorded in the first quarter of 2011. This represents the company’s 47th consecutive quarterly profit over its 12 year history. ANCX has a dividend yield of 2.02% on a 13% payout ratio. ANCX has a 5-year average dividend growth rate of 43%. ANCX increased its dividend 100% in the past year. ANCX has an equity summary rating of 9.9 out of 10 for a VERY Bullish outlook. Harman International Industries Inc.’s (HAR), the maker of high-end stereo, audio and recording equipment and digital products, has notched top-line growth recently by aggressively expanding into emerging markets and from the benefits of an overall recovery in consumer and automotive spending. Harman is gaining audio market share in the luxury auto market and has inked deals inChina and India. HAR has a dividend yield of 0.89% on a 6% payout ratio. HAR has a 5-year average dividend growth rate of 43%. HAR increased its dividend 200% in the past year. HAR has an equity summary rating of 8.5 out of 10 for a Bullish outlook.